Visit India without leaving Hungary. No need to take a long flight to visit India to get into the mood of being at an artistic show in India, cause the Indian Embassy heartily invites all lovers of classical Indian dance of the unique Padmashree awarded dancer: Pratibha Prahlad. She has performed in prestigious platforms in over 85 countries and has given more than 3000 performances in India. She is the Founder Managing Trustee of Prasiddha Foundation & Forum for Art beyond Borders. The artist is visiting Hungary with her 13-member group between February, 11-16. 2017. The classical Indian dance lovers may see the group at Budapest, Debrecen and Szeged. Entry is free of charge – Pre-registration is need at the at the below links. On February,13. 2017. – 6 p.m. – Budapest, Central European University, Auditorium A at District, V., 15, Nádor Street. cultural.centre@indianembassy.hu. At Debrecen, February, 14. 2017. – 6 p.m. – Vojtina – Puppet Theater (Bábszínház) – 13 Kálvin Square. Registration at e-mail: szervezes@vojtinababszinhaz.hu. Szeged welcomes the group on February, 15. 2017. – 3 p.m.- Szent-Györgyi Albert Agóra – 23. Kálvária Blvd. Info will be updated by locals. „Padmashri Prathibha Prahlad is a renowned and a pre-eminent Indian classical dancer. In a career spanning 40 years, she has been a performer, choreographer, educator, author, arts administrator, and a pioneering curator of performing arts festivals. Bharatanatyam is one of the most popular and widely practiced classical dance styles of India, with sculptural evidence dating back nearly 3000 years. A highly spiritual and dedicatory dance form, Bharatanatyam‘s roots go back to the Hindu temples of Tamil Nadu, in South India. The dance moved from temples to theaters over time, but has retained its characteristic devotional component, expression of human emotions, and stylized storytelling. The flexibility of the Bharatanatyam framework lends itself well to both traditional themes as well as modern-day subjects. Originally performed only by female soloists, Bharatanatyam is now performed by male and female soloists as well as ensembles all over the world. In its present form, Bharatanatyam is approximately 200 years old, and continues to evolve as a “living” performance art. Bharatanatyam is composed of three main aspects – nritta, or technical dance, with a sophisticated base vocabulary used to build intricate combinations and rhythmic patterns that does not convey any specific meaning; nritya, or expression dance, using facial expressions, highly stylized gestures, postures and body language to convey any mood; and natya, or dramatic storytelling. This year’s Riverside Festival ready to provide you with pure sporting pleasure organised by József Antall – knowledge Center – Budapest. The Rotaract clubs of Budapest are organizing also a Rotaract Streetball + Teqball Festival on the day of the Danube Regatta Riverside Festival. The Danube Regatta opening ceremony starting at 3.15 p.m. when by universities cheerleader spectacular duel will take place! Rowing in Budapest again for the 4th time … cheering is open for everyone who comes along and watch the year’s biggest inter-university’s sport and culture best on and on the boardwalk of the River Danube – Budapest. Going to be a day of gathering, enjoying the sights-and-sounds floating on the water as the springs sunshine will surely fill the day with much joy and entertainment. 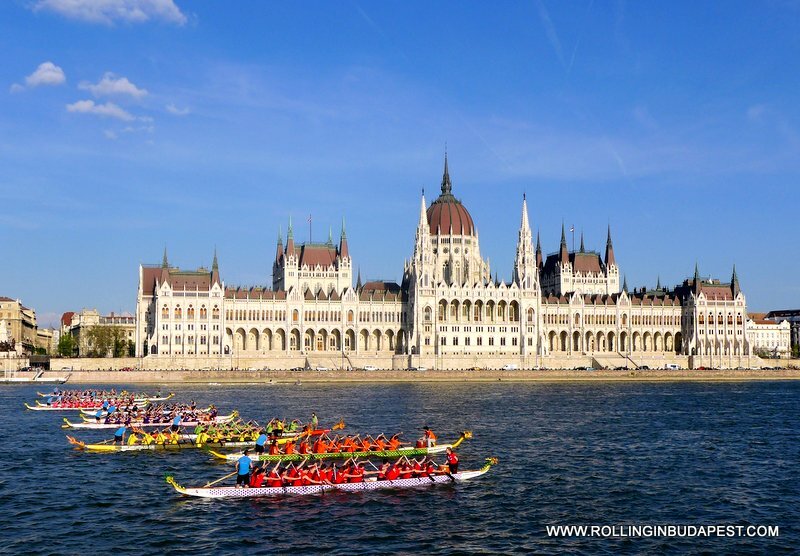 The rowing and dragon boat race will take place on stretch of the Danube in Budapest. The race start from the Parliament passing the Chain Bridge and ends at the Quay – Budapest University of Technology. The observers may watch the participating universities rowers, by rowing eights made up of professionals. The dragon boats will feature students forged into teams during practice sessions leading up to the big race. From Hungary 15 universities will paddle against each other in the dragon boat race, while the rowing eight competition will feature 6 Hungarian teams, aswell as the rowers from the Oxford and Cambridge universities. As in the previous years will fulfill a day of excitements and cheering will break the silence of the River Danube floating onwards. Participating Universities: Andrássy Gyula German Speaking University – Budapest, Budapest Business School, Budapest University of Technology and Economics, Central European University, Corvinus University of Budapest, Eötvös Loránd University, National University of Public Service, Óbuda University, Pázmány Péter Catholic University, Semmelweis University, Széchenyi István University, University of Cambridge, University of Debrecen, University of Oxford, University of Pécs, University of Physical Education, and University of Szeged. 7.15 p.m. – Announcement of the results. The “Capital Cup” competition teams will be ranked according their results in three out four events. … Capital Cup … there are various projects aiming to join central and eastern European countries, especially those in the Danube region, in trade and culture, also sporting events are yet to become in common. In 2015 the three capitals Bratislava, Budapest and Vienna joined in a newly initiated Eights’ Cup. The Capital Cup promotes networking among rowers from the participating nations. The concept of bringing these three neighbouring countries closer together with a series of races seems very appealing, and with this cup, there is high hope as to establish a new tradition. In additional to the Riverside Festival, the newest hungarian invention, the game called teqball will be on the platform. Basically you will be able to play table tennis, just not with a table tennis racket and ball, but using your legs and a football. To enter the teqball game the fee is 2500HUF. Teams can be formed by two people. With the help of the entry fees paid by the participating teams and our sponsors generous contributions, the organizers wish to support the Debrecen-Nagycsere-Halápi Reformed Mission Church. This community provides family and child protection, family daycare, help around the house, and services taking care in the farms and villages areas. Bring your buddies along and play Streetball + Teqball for a good cause! After the Riverside Race need not have to rush away from the venue, because then the party on the Boardwalk will begin with games and performance by the winners of the 2016 Sound of the University battle of the bands, and DJs entertain the visitors on two stages late night until the festival ends.